Online portfolio, artwork, musings, and editorials. But is a pack of dialog balloons I made in Photoshop. Scalable, with a more "natural" feel than the otherwise perfect ellipses and rectangles Photoshop can create by default. I've started growing weary of my comic dialog looking too "clinical" so I thought I'd make some strides to add a little vitality into the balloons. Feel free to use these at your discretion—no credit necessary. I'd personally just like to know what projects you use them on at all, so do drop me a line if you use them for anything. I'd love to see it! All I ask is that if you intend to share them, please just link back here or directly to the deviantART page they're hosted at. I'd just like to know how much traffic these things generate. I'll be making more as time and necessity permits. To get the custom shapes (which you'll have to unarchive and then import into Photoshop) CLICK HERE! To browse selective works, please go to the Portfolios page. Where Else Can You Find Me Online? Comic book adventure by Michael Mayne and Tyler Fluharty. I've got a pinup in Black Jack Press' "Tall Tales from the Badlands" Vol. 2! Check out their whole line! 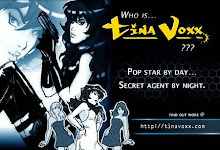 Who is Tina Voxx? Go undercover and find out!